I just finished reading Florence de Dampierre's latest book, Walls: The Best of Decorative Treatments , in anticipation of her lecture next Thursday at the Atlanta Decorators Show House. Unfortunately, I just realized that I won't be able to attend as I'll be getting things together for a Derby Party that evening. (Those of you who follow me on Twitter know that I've been worrying about how to attain the proper shade of green for the Benedictine Dip.) But, all is not lost because I do have Florence's book, and let me tell you, it's really quite good. 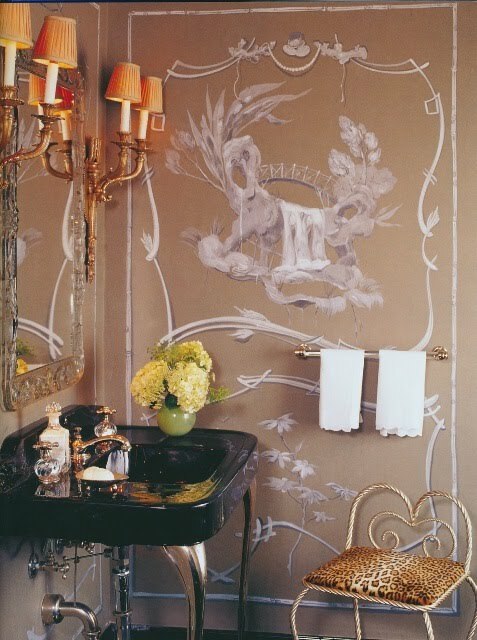 Walls covers the history of decorative wall treatments like wallpaper, stencils, wood panels, and murals. I know that to some people, the word history is enough to make them run for the hills, but please don't let that deter anyone from reading this book. While the text is really very interesting, I think that what truly makes this book a keeper are the beautiful photos by Tim Street-Porter, Pieter Estersohn, and other photographers. 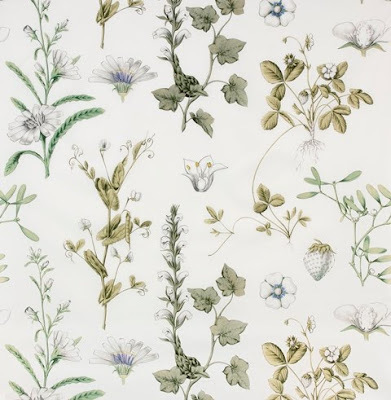 There are images of historical rooms with all kinds of stunning wall treatments (think Caramoor, Beauport, and Schonbrunn) as well as contemporary work by the likes of de Dampierre, Annie Kelly, and Alberto Pinto. Just take a look at the photos below and I think that you might agree. Florence's lecture will take place at the Atlanta Decorators Show House on Thursday, May 5 at 4:00pm. For more information, click here. A colorful mirrored room with gilt bamboo molding by Howard Brodsky. Pieter Estersohn, photographer. The Chinese Cabinet room at Schonbrunn in Vienna. I've seen this room in person, and it's truly unforgettable. Photo from Bridgeman Art Library. The late Dodie Rosekrans' San Francisco dining gazebo. Tim Street-Porter, photographer. 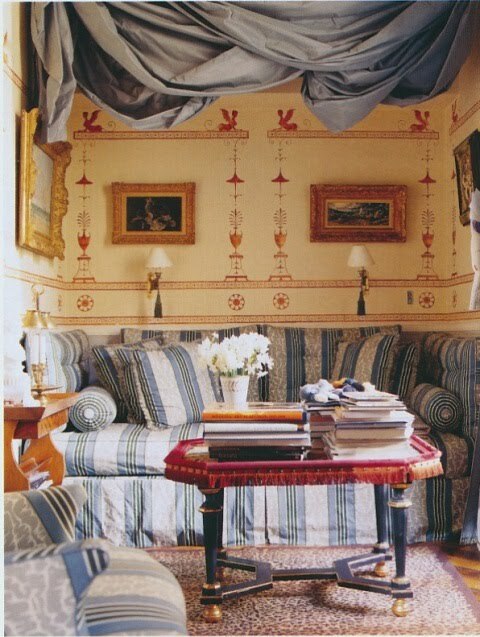 A Parisian study inspired by the Robert Adam designed Etuscan dressing room at Osterley Park, England. Pieter Estersohn, photographer. Framed Chinoiserie scenic wallpaper in an early 20th century home. Pieter Estersohn, photographer. 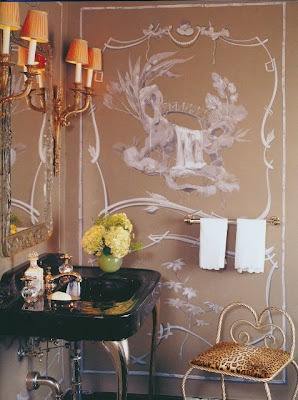 A powder room designed by Thomas Beeton; the Chinoiserie fresco was executed by Dana Westring. I also must say that the black lavatory is good looking as well. Tim Street-Porter, photographer. 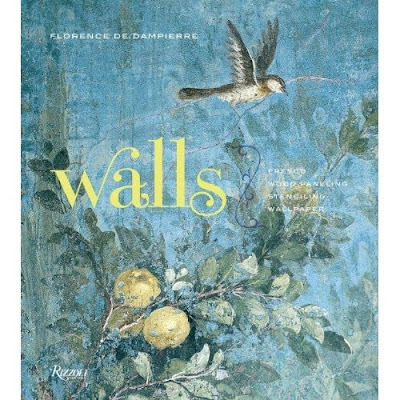 All images from Walls: The Best of Decorative Treatments by Florence de Dampierre, © Rizzoli Publishers, 2011. So, no radishes in the bunch, but I am still excited about Pierre Frey's new collaboration with Deyrolle, the renowned French house known for its taxidermy and other natural curiosities. Come September, Pierre Frey will debut a new line of cotton chintz fabrics printed with three of Deyrolle's classic botanical plates: Arboretum, Prairie, and Verger. I'm completely charmed by Arboretum and have got to figure out where I might use it. At least I have a few months to mull it over before the U.S. debut. For more information, visit Pierre Frey's website. Hip and cool is something that I most definitely am not. The things that I like aren't cool, the music that I listen to isn't hip, and the movies that I watch are old, old, old! Anyway, any attempt at being cool would be dashed by my posts on my likes and dislikes. And the like that we'll discuss here today is...radishes. Quite frankly, I'm not big on the taste of radishes, especially if they're too hot. (Some radishes even taste like dirt. Well, to me at least.) 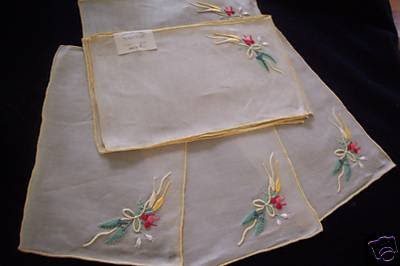 China, linen, and porcelain with radishes on them, on the other hand, never fail to whet my appetite. It's an odd thing to like, I know, and I have no earthly idea why this City Girl would be taken with of all things a root vegetable. 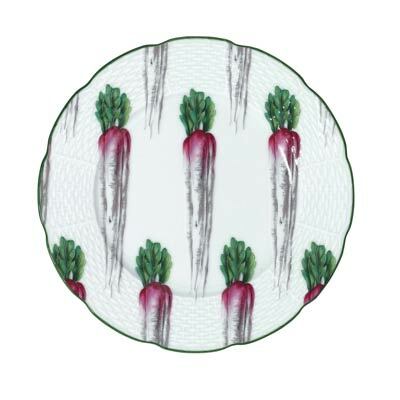 Really, who knew that radishes could be so haute cuisine? 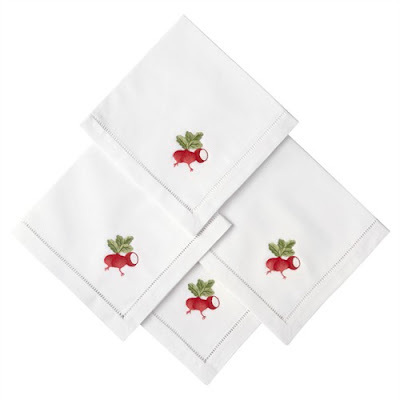 Embroidered Radish napkins by OKA Direct. Look at these vintage Marghab napkins that were sold at auction. Tiny radishes, peas, and carrots were held together by a yellow ribbon. This is one of my trompe l'oeil pieces. 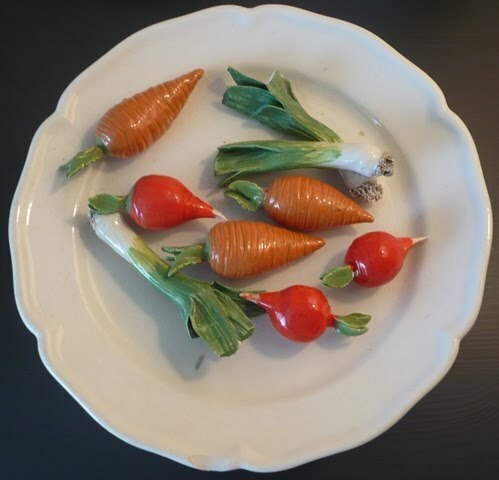 I admit that the radishes and carrots don't look terribly realistic, but the green onions look pretty good. 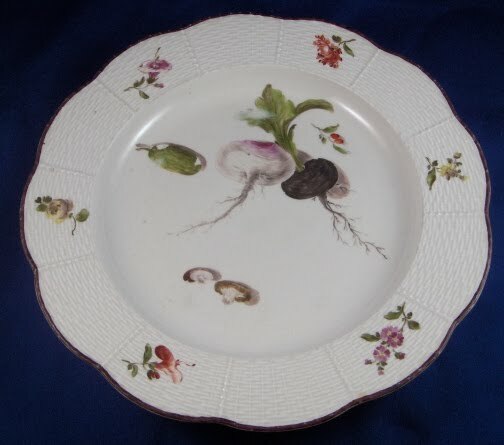 A Royal Vienna radish plate from around 1760. 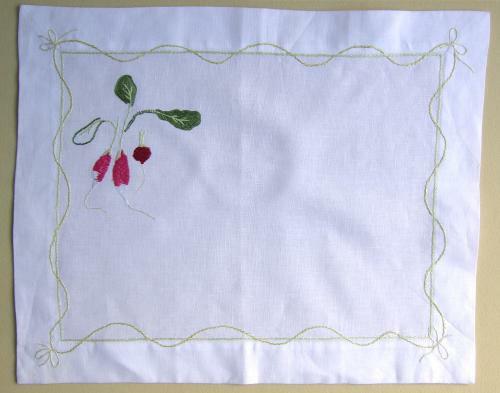 Seeing that I can't do this kind of needlework, this placemat kit won't work for me, but I do find it charming. Image at top: My Porthault hand towels have radishes and other veggies on them. Last week, I attended a luncheon at which Charlotte Moss was the guest speaker. If you've read any of her books, you know that Charlotte finds inspiration in almost everything: travel, architecture, books, flowers, fashion. It was interesting to learn what sparks her imagination and how that spark might manifest itself in a later design project. Take, for example, Madeleine Castaing's pink and black bathroom (at top). 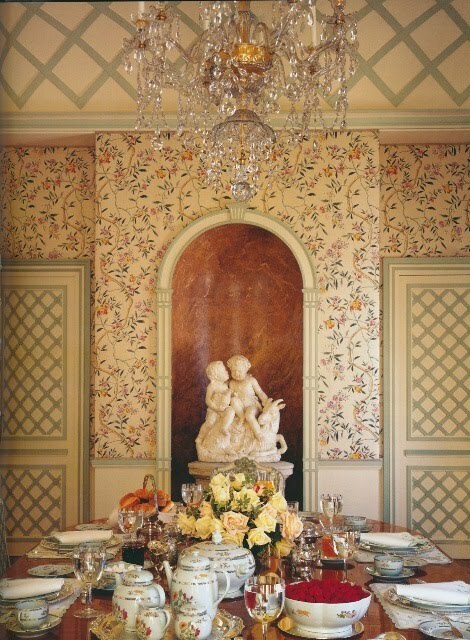 Charlotte has long been a devotee of Castaing, and the particular color combination used by Castaing intrigued Charlotte- so much so that Charlotte later used a pink and black color scheme for her table setting that was photographed for At Home with Wedgwood: The Art of the Table . You can see that Charlotte chose a pink cloth and napkins as a backdrop for her black basaltware. 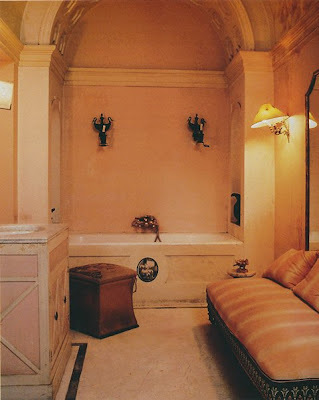 Very striking just as Castaing's bathroom was. Inspiration can be a funny thing. There are times when we see a photo or a color combination, for example, and might actively find a way to incorporate it into whatever it is we're working on. But then there are times when inspiration can be more passive. 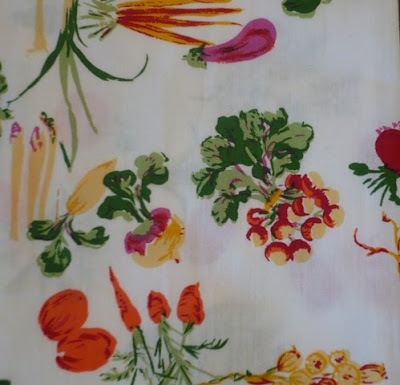 You might be struck by the mood or feel of something, and only much later do you realize that that "thing" has found its way into one of your creations- maybe a piece of art if you're an artist, or perhaps a dress if you're a fashion designer, or even a table setting if you like to entertain. This not so "deep thought" occurred to me after Charlotte's lecture. When thinking about the Castaing influence on her Wedgwood table setting, I remembered this photo of the Maharaja of Jaipur, featured in The World in Vogue , that I first saw well over a year ago. 1) Buy these Rajasthan table linens by Le Jacquard Francais. 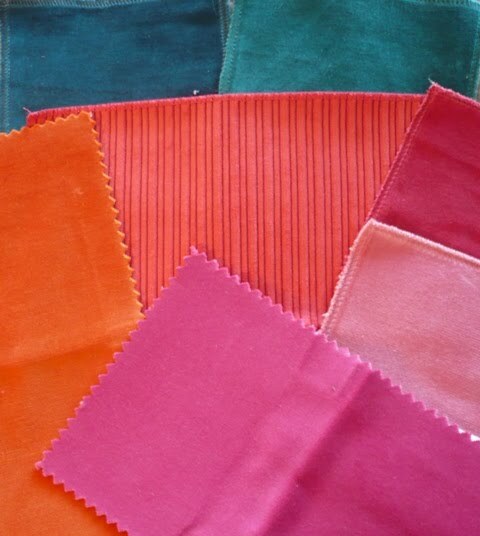 My linen closet is filled with solid-colored hemstitch napkins and some Porthault here and there, but when I saw Rajasthan last Fall, I was so taken with the pinks and the oranges that I had to have them. 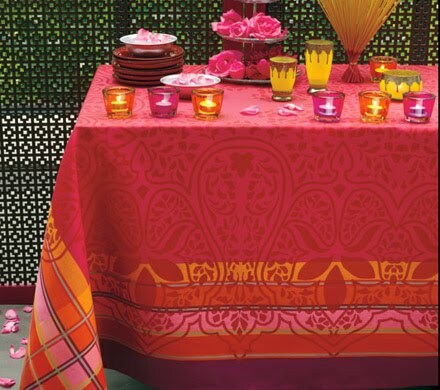 The Maharaja never once crossed my mind while making this purchase, though. Or did he? 2) Arrange my books by color. Well, at least on one shelf. Now you know that I'm one of those people who will not arrange books by color. I have a system that works for me and organizing by color would mess that up. But on one shelf of books on fashion, I found myself stacking rows of pinks mixed with some reds. How did that happen? Maybe the photo had something to do with it? 3) Pull fabric samples that seem to fall in the pink, coral, orange, or peacock blue range. They tend to all be velvet, which isn't very Indian-like, but the colors certainly are. 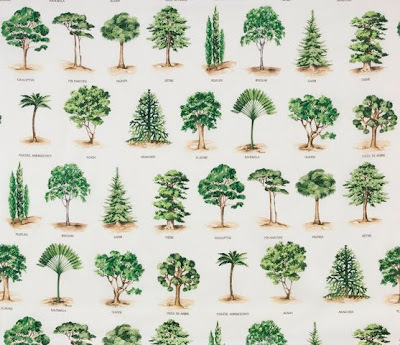 Now, where should I use this fabric??? Of course, there very well may have been other factors, and obviously I'm not the only person currently influenced by these particular colors. 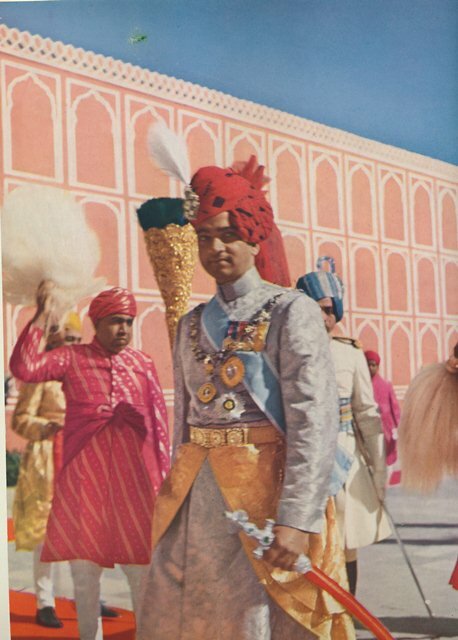 But, perhaps that photo of the Maharaja was the spark that I needed to branch out and experiment with a new color palette. Corners of rooms can, at times, be tricky. Depending on the layout of the room and the furniture placement, one can end up with dead space in the corner. It's kind of like an awkward silence in a room. It's an issue that I'm currently dealing with in my study. On one of the long walls, there is a sofa, and against the adjoining wall, there is a sliding glass door and enough wall space for a small chest. The result is that the corner looks empty and boxed in. Screens can be a great option for hiding desolate corners, but unfortunately there just isn't enough space for one in my study. I think that I found the answer to my particular problem. I plan to display a tall painting, one done by my sister, on an easel in the corner. Now the only glitch is finding a decent looking easel that goes with the rest of the room, but that's an issue for another post. I suppose that because this design challenge has been on my mind lately, I've become attuned to how others have dealt with corners. And one of the more interesting solutions that I've seen is the use of mirror to obscure the corners altogether. The most common approach to mirror is to sheath entire walls in it. 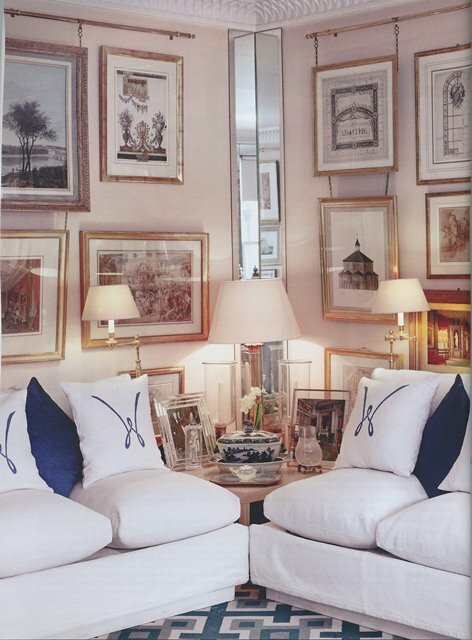 In the photo at top, designer Louis Tregre mirrored chimney breast and wall in squares of mirror and extended it to window. It worked well because it minimized the jogs of the chimney breast, niche, and support column, making the wall seem a bit more uniform. 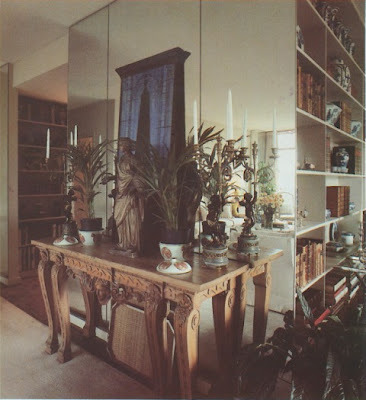 I am absolutely smitten with this image of an apartment decorated by the late David Barrett. 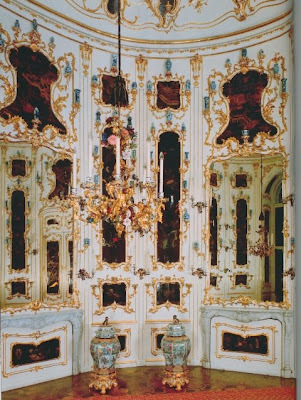 Barrett mirrored an awkward corner, then extended the reflective surface by placing a mirrored screen next to the mirrored corner. And if that wasn't enough, he used a mirrored cube table and a mirrored pedestal in this corner as well. 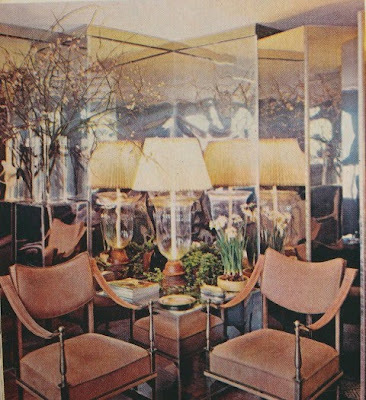 The late T. Gordon Little mirrored the support column in the corner of his Plaza Towers living room. To be honest, I don't think that the mirror really does an effective job at hiding the column (and perhaps that wasn't Little's objective), but I do like the way it looks. The mirror added some shimmer to what could have been a clunky corner. A more restrained use of mirror is seen here in the London flat of Walter Lees. 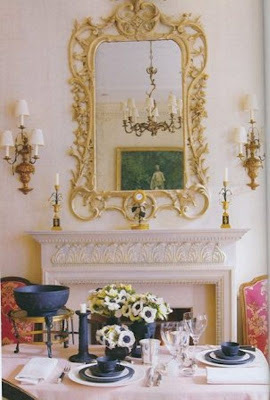 At first it seems a little odd to use two slivers of mirror to decorate a corner, but here, I think it worked. If Lees had not balanced out the mirror with drawings and sofas on either side, the mirrored corner might have seemed too forced and obvious. Tregre and Barrett images from House Beautiful, January 1971. Little image from Southern Accents, Winter 1977. Decorator Dorm...that's what some people call the building in which I live. 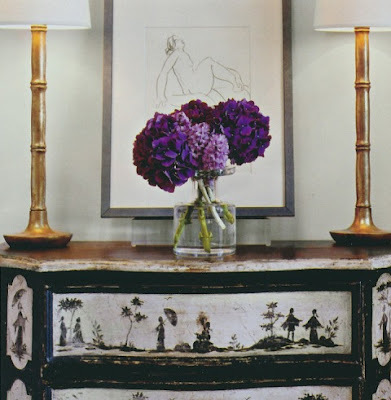 It makes sense as we have many designers, showroom owners, antiques dealers, a lighting expert, and a few design bloggers who call Plaza Towers home. I guess you could say safety in numbers. This isn't a recent phenomenon, either. Designers have long gravitated to Plaza Towers because of the location (so convenient to ADAC) and the "blank canvas" appeal of the apartments. You can make them contemporary, midcentury modern, traditional, or, to use a term that I'm not crazy about, transitional. The apartment that I'm showing here is what we non-New Yorkers might call a "New York apartment." 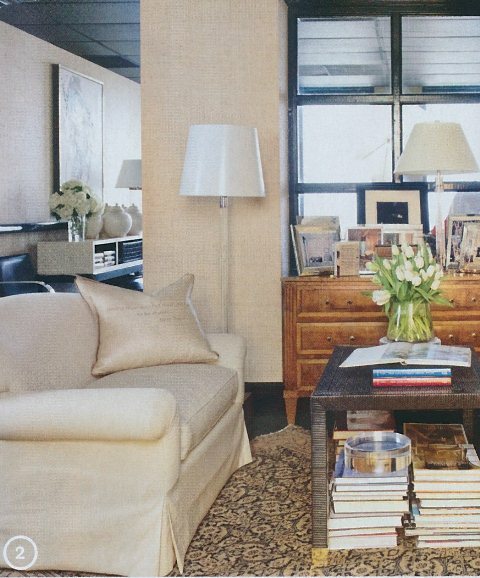 That's a compliment that many of us bestow upon chic apartments that have that Manhattan look to them. 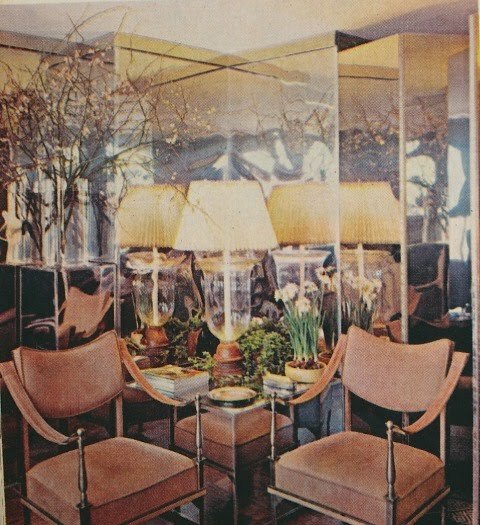 You know, a sophisticated apartment that comes to life at night thanks to a clever use of mirror, reflective finishes, and luxe objects. 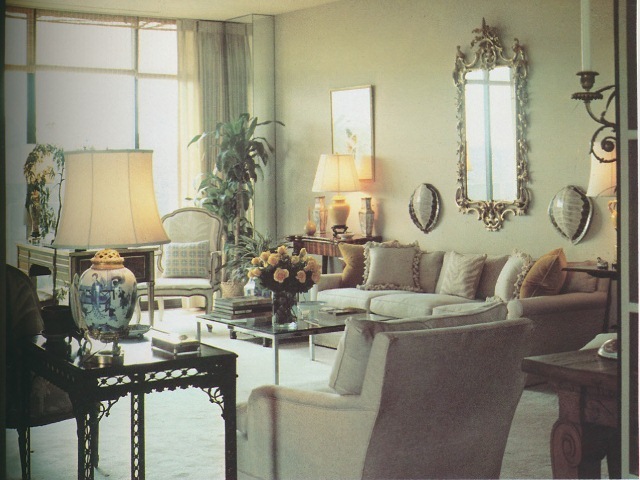 This particular apartment was the home of the late, well-known Atlanta decorator T. Gordon Little, a man known for his great style. 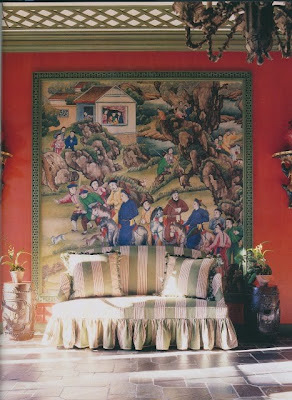 Like so many designers of his era, he had a very fine collection of antique furniture and porcelain and artwork. 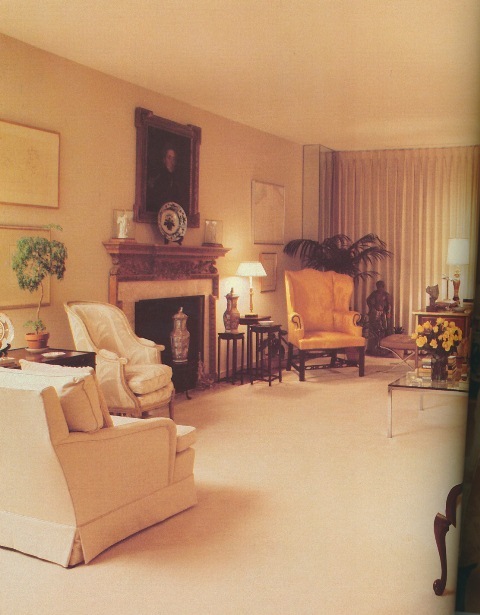 But what gives his home snap is the way in which he mixed in contemporary pieces like a glass and chrome cocktail table and a Mies van der Rohe Barcelona stool. 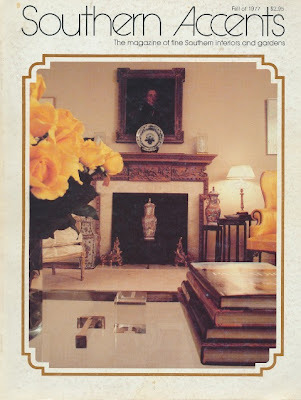 While most of the furniture and accessories might be deemed traditional, there was a sophistication to everything that made his home seem quite cosmopolitan rather than stuffy. Keep in mind that these photos are over thirty years old (they appeared in the first issue of Southern Accents in 1977), so the colors might seem a little drab. Still, I think the photos prove that traditional antiques don't have to be as old-fashioned looking as some people might think. 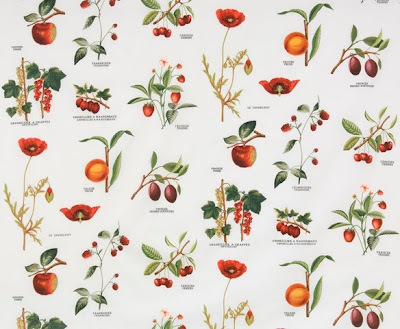 One more thing- I couldn't resist including Little's thoughts on "eclectic", a look that many of today's designers strive for and a term for which Little did not care. 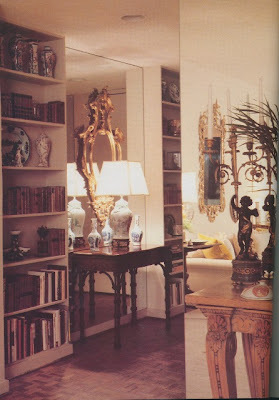 He said, "I believe that the truly eclectic interior contains pieces that seem unrelated yet, in fact, are related, either intentionally through scale or connotation (historic, literary, romantic or intellectual) or simply by the personality and idiosyncrasies of the person who assembled them. I feel that so many rooms professing to be eclectic are merely a mishmash of totally unrelated objects thrown together cavalierly in the hope that, by some miracle, or just because they are unrelated and therefore fashionable, they will look wonderful." Just some food for thought. A very good antique Chippendale card table stood amongst a mirrored wall and bookshelves in the home's entryway. A daytime view of the living room, a space in which Little managed to include a fair amount of furniture. Thank goodness for these photos because furniture placement in my living room has, at times, given me fits. And the living room at night. A William Kent console holds an antique terracotta figure, porcelain cachepots, and antique French candelabra. 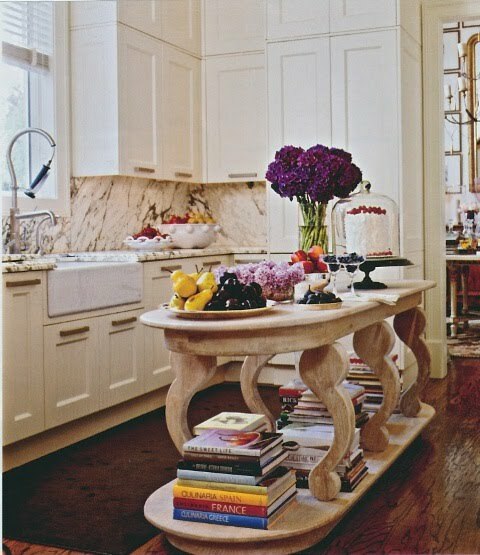 A glass top dining table was supported by an old stripped pine Corinthian capital. The chairs were Irish Chippendale. 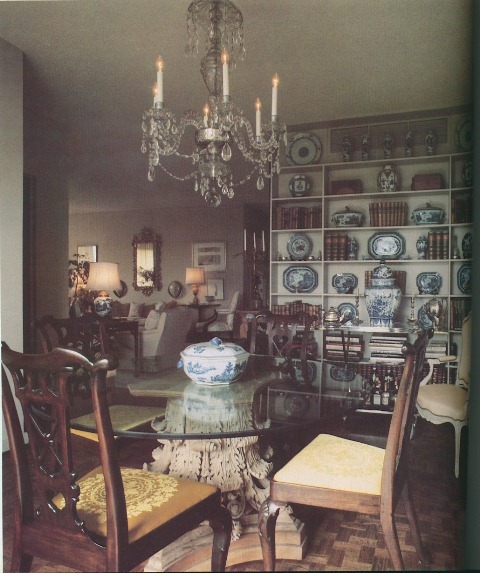 I think that my favorite part of the dining room was Little's porcelain collection displayed amongst the bookshelves. 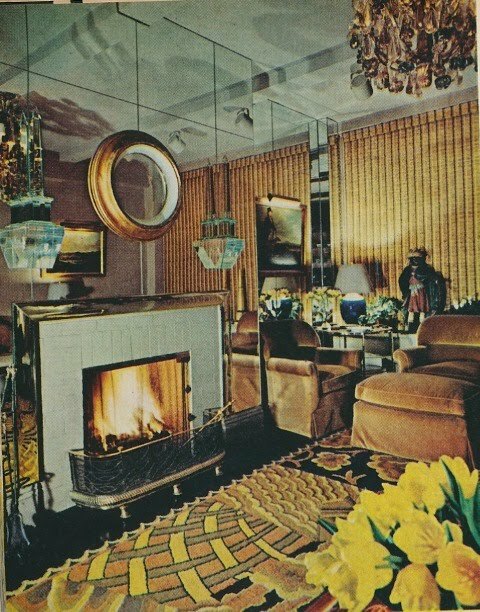 Remember, it was 1977, so the Mylar paper on the kitchen walls was quite chic at the time. My kitchen still has the original lights like that seen here. 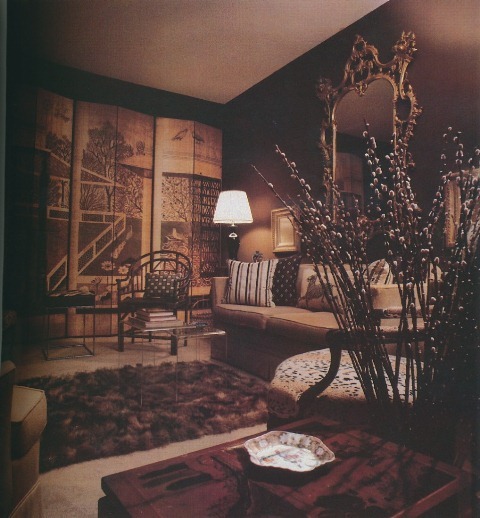 The chocolate brown study was the most modern looking room of the apartment. 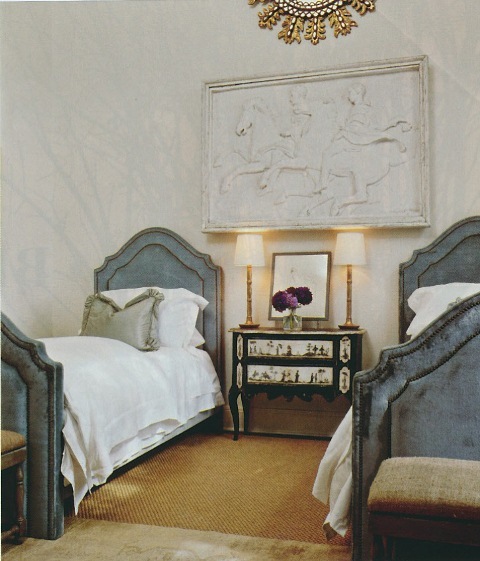 The closet's louvered doors were covered in panel wallpaper (new at the time), making the doors look like a screen. Now that was clever. The Baton Rouge house featured here is quite attractive, don't you think? 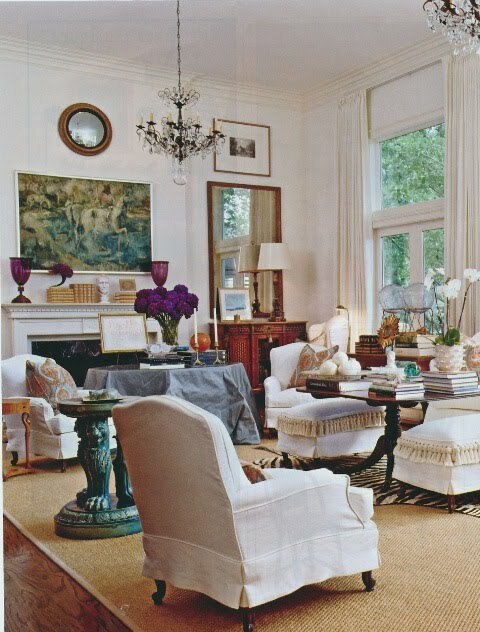 It's light and airy, and yet the layering of antiques and objects gives the home substance. Those white walls and upholstery certainly help to bring the homeowner's artwork, books, and bibelots into sharp focus. So much so, in fact, that in almost every photo, my eyes immediately zoomed in on the cut Hydrangea. How stunning are those mopheads in that rich, blue tinged shade of purple? Hydrangea in shades of white and green seem dignified and even a tad matronly (I mean that as a compliment), while periwinkle and pink show off Hydrangea's fun-loving side. But the deep purple seen here? Va-va-voom! All images from Southern Accents, May/June 2009, Antoine Bootz photographer. 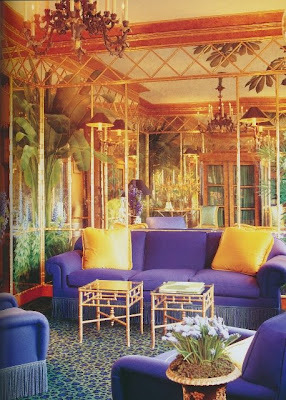 Interior design by Jeff Woosley. Stan Topol is a designer who has intrigued me for years. While growing up in Atlanta, I knew him "Elton John's designer." This was back in the late 1980s or early 90s, and for a Southern city that was starting to boom, Elton buying a high-rise apartment in Buckhead was huge- really huge. And that, to me, made Stan huge too. But what really did it for me was something that happened during the '96 Olympics. I remember driving through one of the busiest intersections in Atlanta, and standing high alongside the road was a billboard featuring an Amex ad. But this wasn't any ordinary Amex ad. Oh, no. It had Stan Topol leaning back with his arm draped over a chair, flashing a grin. And then it said "Buckhead is my neighborhood. This is my card.... Stan Topol, Cardmember since 1984." Now seriously, how great is that?! How many interior designers do you know who have been featured on a huge billboard smack dab in the middle of a metropolitan city? Flash forward to 2011 when I recently got to help produce a House Beautiful shoot of Stan's Midtown Atlanta office. I know that you rarely see offices in House Beautiful, but this one is completely different. First, it looks more like a home, a very chic one. 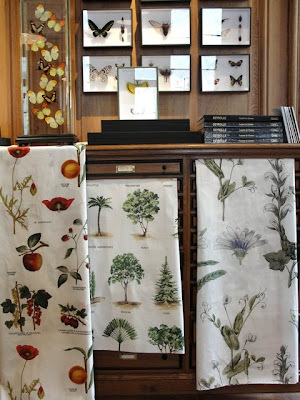 The office is filled with classic pieces like Bielecky Brothers cane furniture, glass tables and lamps, and wonderful artwork. And these are pieces, mind you, that Stan has had for years. Just goes to show that good design never goes out of style. But what also captivated me about the space is Billy Baldwin's influence on it. Stan was an assistant to Baldwin and learned a great deal from the master. You can see bits of the Baldwin look throughout the office, but Stan certainly has put his mark on the decor as well. The article highlights many of Stan's design rules and secrets, but if there is one thing that I learned from it, it's that the classic contemporary American look from the 1960s and 70s still looks positively au courant in 2011. 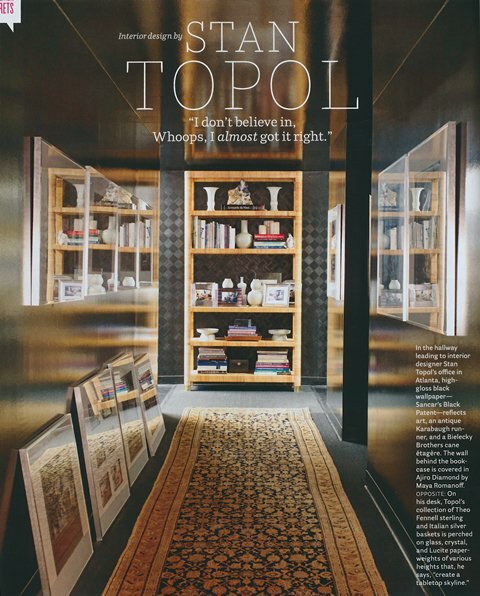 To read the entire article, pick up a copy of the May issue of House Beautiful. 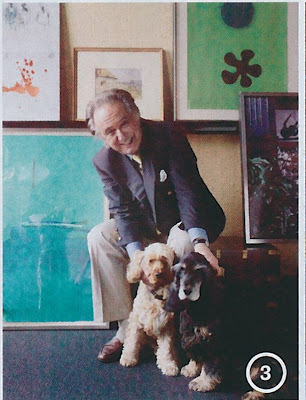 Stan with his English Cocker Spaniels, Oliver Twister and Oskar North. A sitting area in Stan's office. The throw pillow is embroidered with Stan's motto: "Having style doesn't mean one has to be stylish." All photos by Thomas Loof, House Beautiful, May 2011.